For owner-operators who have decided to buy a used semi-truck, it's important to perform a thorough pre-purchase inspection on the rigs you are considering. Start by checking True Blue Book to see if the models you are looking at are priced appropriately. Don’t waste your time inspecting trucks that are not in the right price range for that model, year, mileage, and manufacturer. Once you’ve narrowed down your choices, call to schedule inspections. Most semi-truck engines will go up to a million miles if properly cared for, so more important than the number on the odometer is the maintenance history and a clean inspection report. Those two records will give you the confidence to buy knowing the truck is in good working condition. A pre-purchase inspection is similar to the CDL pre-trip inspection, but involves a more in-depth look. If you are familiar with the mechanics and components of the truck, you can use the following guidelines to complete an inspection yourself. If you’re not, it’s best to leave the inspection to a professional. Check the frame – Frame damage on a semi-truck trailer is expensive to fix, but not repairing it will result in severe tire wear. Look for cracks, bends, sagging, or welds. Look for rust – Any rust found on the exterior of the truck is a warning sign. Inspect all bolts, lug nuts, headlight casings, and body panels. Examine doors and pay close attention to hinges and outer edges. Examine the tires – Inspect the drive tires to ensure they are the same manufacturer, size, and exhibit the same amount of wear. Look for any cracks or bulges. Inspect the exhaust – When the engine is warm, check the exhaust for smoke. An exhaust system that’s burning oil will smoke; one that’s clean will not. Feel along the brake drum – Look for cracks, corrosion, leaks, or anything that feels rough. Check the brake pads as well. While new pads are an inexpensive repair, it’s good to know their condition. Test out the seat and the bunk – Make sure the seat is comfortable and all the adjustment features are functioning. If you are looking at sleepers, try out the bunk. A mid-roof or high-roof adds space for comfort and may be worth seeking out if you plan on living out of the rig for long periods. Turn on the lights – Test the headlights and brake lights and have the salesperson confirm they are operating as they should. Look for leaks – Inspect the radiator and all hoses for visual or audible signs of leaking. Touch the belts – Run your hand along the belts and feel for abnormalities, fraying, or cracks. Belts shouldn’t be too loose or too taut. Look for between ½ inch to ¾ inch of play. Check the oil – Oil level should be at the full line on the dipstick and oil should look relatively clean. If all looks good, you’re ready for a test drive. Take note of how the truck accelerates and decelerates, how it handles, and how the suspension feels. Listen carefully for engine or brake sounds that might indicate an unseen problem. 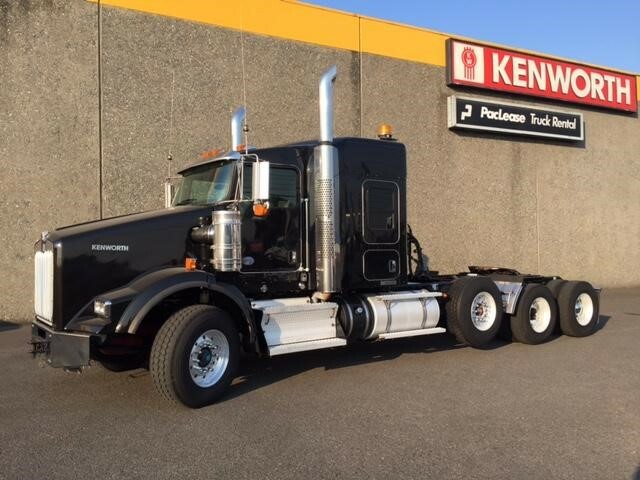 If you'd like to have a professional pre-purchase inspection done, contact the experts at Papé Kenworth. Our service technicians are highly trained on all makes and models and can help you feel confident about your purchase.